Alfred Coffman- Was He Really an Odd Fellow? This photo was from the Nancy Pemberton-Spangler photo album. The photo was received from Cal Sale, P.O. Box 41093, Des Moines, Iowa 50311, April 2003. Have you ever discovered history in your backyard? 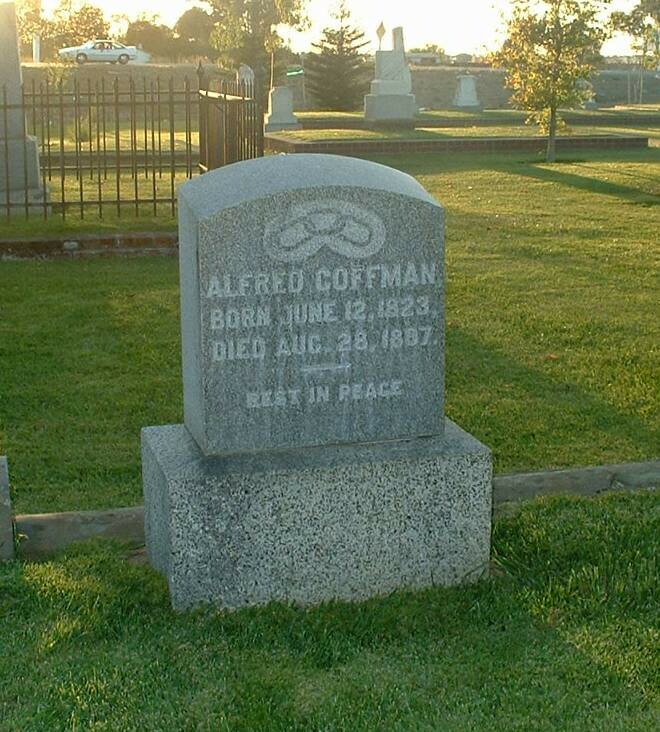 Alfred Coffman was my fourth great uncle and he lived almost literally in my backyard in Sacramento. During my kindergarten year, we moved from Carmela Way to Craig Avenue in Sacramento. When we first arrived on Craig Avenue we lived on the very southern edge of Sacramento. On a clear day, we could look out our two south facing patio doors and see Mt. Diablo. To the southeast of where we lived in South Sacramento was the town of Elk Grove, California. Alfred Coffman settled near Elk Grove in 1875. I attended John F. Kennedy High School in Sacramento and graduated in 1971. About ninety years earlier, Alfred Coffman was involved in the founding of one of our rivals, Elk Grove High School. We could not quite see Elk Grove High School out our back window but it was only 10 miles away from my house. Elk Grove Union High School was the first union high school in the state of California. Sixteen elementary districts voted to tax themselves for a high school, and they all remained as separate districts until the entire K-12 district unified in 1959. Alfred Coffman canvassed the voters in the elementary districts to get their votes for the Union High School. The high school opened its doors in 1893 at its first site on Main Street now Derr Street and Elk Grove Boulevard in Old Town Elk Grove. In 1973, my wife, Robin Harrington graduated from the new Elk Grove High School. 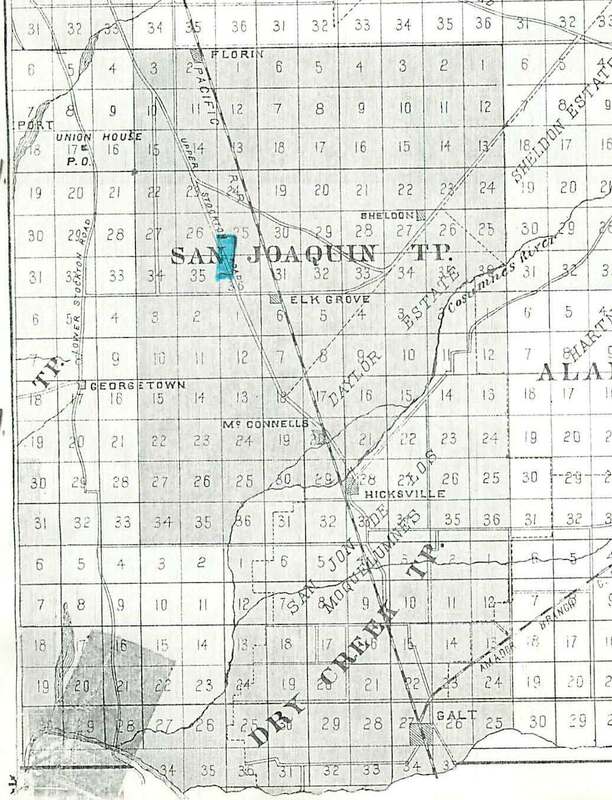 My second great grandfather, Archibald Wilson Coffman moved to California prior to 1880 and was residing near his uncle, Alfred Coffman in San Joaquin Township where Elk Grove is located. And the rest as they say is history. Counting from my direct ancestor, Archibald Coffman, I was in the fifth generation of Coffman descendants to live in California but there were six generations if you include Alfred Coffman in the lineage. Because of the fact that my grandmother, Elaine Coffman was born in New York, I did not realize that I had such deep roots in California. "Alfred Coffman was born in Hamilton County, Illinois, June 12, 1823, son of Jacob and Ayre (Fowler) Coffman...Alfred, the subject of this sketch, followed farming and cattle-raising in Illinois, for fifteen years. In 1875 he came to Sacramento County, and he and his brother-in-law rented the Curtis ranch, which he worked four years. In 1879 he bought a farm of 320 acres, thirteen miles from Sacramento on upper Stockton road one mile from Elk Grove. He was married in 1844, to Miss Sarah Pemberton, a native of Kentucky, who died in 1865 [her tombstone says she died 17 Apr 1863] leaving sixteen children, three sets of twins, five living to become twenty-one years of age. 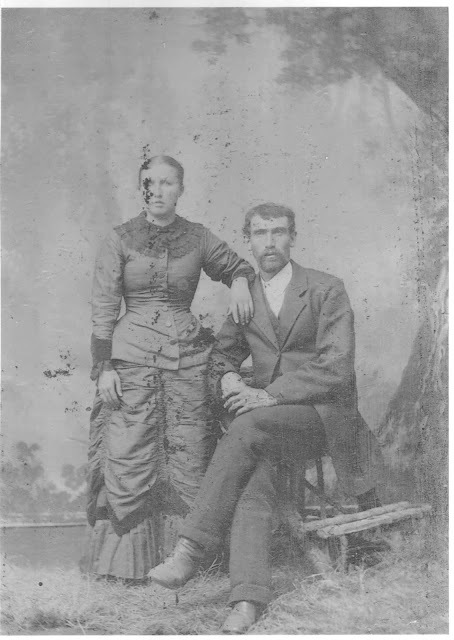 He was married again in 1866 [they were actually married in 1863 in Des Moines County, Iowa], to Miss Elsie Howard, a native of Iowa, by whom he had three children, two of whom lived to become of age... The subject of this sketch carries on a general farming business. He was at one time one of the greatest grain-raisers in this county, having had as high as 7,000 sacks of wheat from one year's crop. In the State fair of 1887-'88 he took a premium on wheat. He raises his own vegetables, fruit and grapes. He has an orange tree from which he sold $10 worth of fruit in 1888. He is a member of Elk Grove I.O.O.F., No. 274." 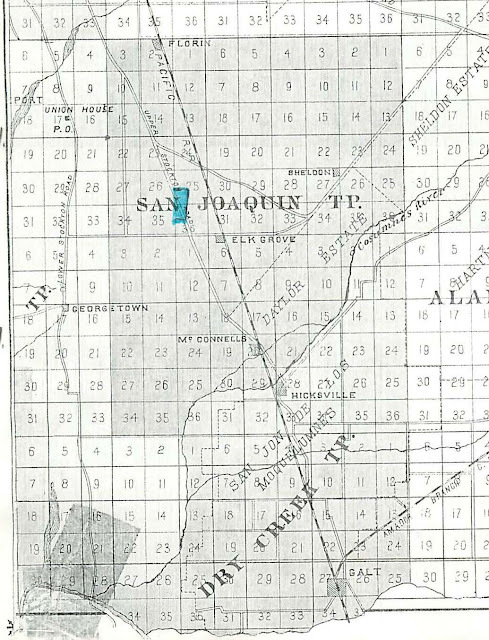 The location of the Alfred Coffman ranch is shown highlighted in blue. When I was growing up, we knew the "upper Stockton road" as Stockton Boulevard. Half of the 320 acres that he bought in 1879 were owned by Hans Feickert in 1991. We visited with Hans and he shared many of the historical documents that he had collected. The Alfred Coffman ranch contained 160 acres in the southwest quarter of section 25 and another 160 acres in the northwest quarter of section 36. The Feickert place was the NW quarter of section 36 and six acres to connect to Upper Stockton Road. 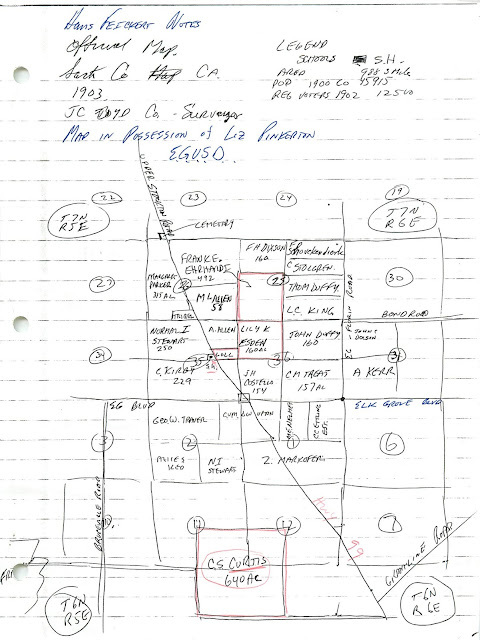 Hans was able to locate the Curtis ranch which was 640 acres about two miles south of Elk Grove as shown in his hand drawn map and notes below. "In the spring of 1893, a meeting was held in Toronto Hall, and the subject [of a new high school] discussed. [The leaders of the high school movement] secured the services of Mr. Alfred Coffman, a trustee of Old Elk Grove District, and a man who, though having had very little schooling in his boyhood, took a deep interest in promoting education among the boys and girls. Mr. Coffman drove through eighteen districts, interviewing all the residents and trying to convince them of the advantages that a union high school would be to their community. He asked the head of every family to sign his name to a paper, stating whether he was in favor of or opposed to, the movement. Dr. McKee carefully arranged that, in Mr. Coffman's campaign, Elk Grove was kept the central point of the territory canvassed. The opposition which the recent campaign for a new high school met, vividly recalled those days of 1893, when interest was waxing warm in the establishment of the high school. Mr. Coffman met with many rebuffs, which sometimes really amounted to insults. But his earnest work was rewarded. An election was called in each district and a vote taken on the establishment of the union high school; it carried in sixteen districts." 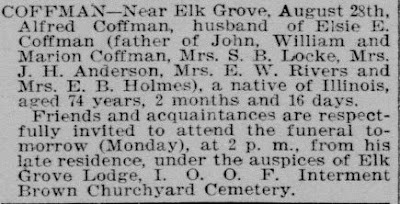 Alfred Coffman died on 28 August 1897 and the following article appeared in the Sacramento Union newspaper. Sacramento Daily Record-Union, Sunday August 29 1897, p. 11 "A GOOD CITIZEN GONE-- Alfred Coffman's Death the Result of His Injuries" "Last Monday Alfred Coffman a well known citizen living near Elk Grove, was thrown from a load of wheat by a sudden movement of his horses, and his breast was badly injured. He died yesterday morning, it being supposed that an artery burst and that he bled to death. He was a native of Illinois, aged 74, and leaves behind a number of children-three sons, John, William and Marion Coffman, and four daughters, Mrs. L.B.Locke, Mrs. J.H. Anderson, Mrs. E.W. Rivers and Mrs. E.B. Holmes. Mrs. Rivers of this city is the only daughter living in this county, the others living elsewhere in the State and in the East. The funeral will take place tomorrow at 2 p.m. from his late residence. Mr. Coffman was a man whose integrity and sterling qualities had won the regard of his friends and neighbors, and they will deeply regret the loss the community has sustained in his death." 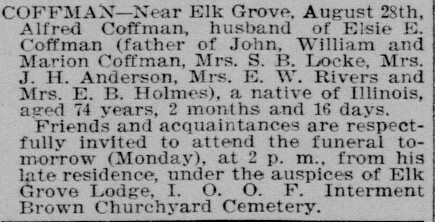 The Evening Bee, Tuesday August 31, 1897 "ALFRED COFFMAN'S FUNERAL--One of the Largest Ever Seen in Vicinity of Elk Grove-- The funeral of Alfred Coffman, who was a prominent citizen of Sacramento County, took place at 2 o'clock yesterday afternoon from the family residence near Elk Grove. The funeral was one of the largest ever seen in that part of the county, and it was under the auspices of Elk Grove Lodge, No. 274, I.O.O.F. The following members of the lodge acted as pallbearers: John Mahon, H.S. Putney, Geo. Taylor, W.D. Haas, S.W. Kennedy, H.G. Alltucker. The members of the Elk Grove High School, which Mr. Coffman had helped to establish, attended the funeral in body. The sermon was preached by Rev. A.C. Duncan." The article above helps to confirm the role of Alfred Coffman in the founding of Elk Grove High School and the appreciation felt by the students. New headstone of Alfred Coffman in San Joaquin Township, Cemetery. There was another stone on the grave that measured five feet high when I visited in 1991. The 1890 history of Sacramento County tells us more about Alfred Coffman's role with Elk Grove Lodge, No. 274, I.O.O.F. The lodge met at Elk Grove, Saturday evenings, in the hall over Everson's store. It was organized May 2, 1878 and Alfred Coffman was a charter member and the first treasurer. He was also treasurer in 1890. There were 36 members in 1890 which was the largest number in its early history. The Odd Fellows Building was valued at $800 in 1890. So Alfred Coffman was indeed an "Odd Fellow." The Elk Grove Odd Fellows building was photographed and this photo was placed on Waymarking.com in 2011.